The Fox and Franz Josef glaciers are New Zealand’s largest and most magnificent glaciers, and many visitors find it hard to choose between them. 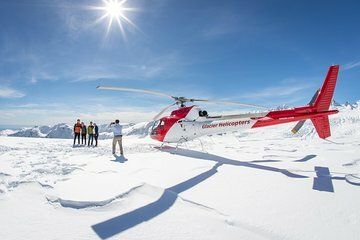 This 30-minute helicopter tour takes in both with a thrilling flight over snowy peaks and frozen waterfalls, and an unforgettable snow landing overlooking the glacier. Make your own way to the helicopter base to board your helicopter. After meeting your pilot and listening to the safety briefing, buckle up for an exhilarating flight and take off over the Fox Glacier Township. Soar over the Fox glacier, gazing out over the snowy landscapes, frozen rivers, and rugged peaks, then swoop low over the Franz Josef glacier, enjoying dramatic views of the glacial cliffs and ice falls. Finally, touchdown on a snowy mountaintop and feel the thrill of walking along pristine snow in an area inaccessible to hikers or land vehicles. After posing for photos against a stunning snow-blanketed backdrop, jump back aboard for the return journey.